Following in the tradition of the most popular Pathfinder Player Companion of all time. Adventurer's Armoury 2 is a comprehensive guide to equipment of all sorts. Containing a wide array of new adventuring gear, alchemical items, armour, clothing options, magic items, poisons, tools, traps, and weapons to outfit any character, this guide is a welcome addition to any armoury. 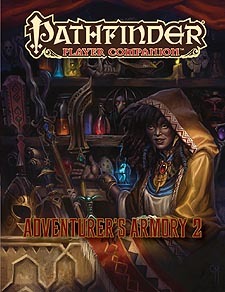 Whether you're looking to gain the edge in combat or fit in to a social situation, Pathfinder Player Companion: Adventurer's Armoury 2 has you covered! New feats, spells, and skill tricks to allow any adventurer to get the most out of the equipment they already own. Armour and weapons modifications, allowing smiths or skilled adventurers to customise equipment on the fly to meet specific needs. New construct familiars known a puppets - stuffed or wicker dolls crafted to carry out simple tasks at their masters' bidding.